Burnley manager Sean Dyche has no intention of compromising his beliefs, even though he knows they could be costing his team. Dyche felt Everton's Kevin Mirallas should have been sent off during his side's 1-0 defeat at Goodison Park. 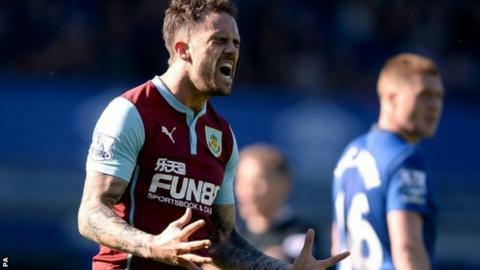 BBC pundit Chris Sutton said the tackle on George Boyd was a "leg-breaker" but Burnley's players did not make a fuss and Mirallas only got a yellow card. "Fans don't want to see players surrounding referees," said Dyche. "It is frustrating. You try and do things in the correct manner and it doesn't work for you. "But it is not a route we plan on going down." Dyche's team are now at the bottom of the Premier League and still have only one away win this season. The Burnley boss felt a number of referee Mike Jones's decisions went against his team, including two penalty claims and the one Everton did get in the 10th minute for David Jones's foul on Aaron Lennon. Burnley felt it was outside the area, although Ross Barkley missed the spot-kick. Dyche did agree with the first-half dismissal of striker Ashley Barnes, who he felt was guilty of two "rash" tackles. But he couldn't understand how Mirallas escaped the same fate early in the second half. "Mirallas is not that type of player but that is irrelevant," said Dyche. "It is a red card, as simple as that." "People want to see people fighting in a fair and proper manner. We try to do that."